Most dads like to give gifts to their children. Some dads give toys, some give treats. Others give money, books, or clothes. But one pair of dads—whose children had no speech of their own—gave a gift that meant much more than any of those. They gave the gift of voice. Brian Whitmer and Scot Wahlquist had one big thing in common—each of them had a child who could not communicate vocally. Brian’s daughter, Becca, was born with Rett syndrome, a rare genetic disorder that left her unable to speak or control her body movements. For years, Becca could only communicate by indicating “yes” or “no” with her eyes. Scot’s son, Adam, has autism spectrum disorder (ASD), and like one quarter of all children on the spectrum, he is nonverbal. Adam has better control over his body than Becca and began using an iPad in order to communicate with his family; however, his energetic escapades often resulted in a missing or broken speech device. Convinced there had to be a way to help his daughter, Brian, a computer programmer by trade, dedicated himself to creating a cloud-based augmentative and alternative communication (AAC) app that works on nearly all devices. It has created strong supports for parents, teachers, and therapists who encourage an AAC communicator. He called it CoughDrop. The moment he learned about CoughDrop, Scot knew he wanted to be a part of it, because it was exactly what his son needed. Following intense research and input from dozens of speech professionals, Brian shaped CoughDrop into an AAC app that could fit any communication need. He wove in features to provide reports and usage information for parents and therapists. He created ways for communicators to share messages via email or social media straight from the app so they could connect with the world. He worked hard to make the program user-friendly and easy to maneuver, and he added a two-month free trial so people could try it out for themselves before buying. While Brian wrote the code and crafted programs, Scot began spreading the word and encouraging CoughDrop to grow. Suddenly, the pair of fathers-turned-app-designers was not only bringing their own children a pathway to speech, they were also traveling the country trying to bring a voice to any person who needed one. Because they knew first-hand the struggles a family faces when communication is an obstacle, these fathers wanted to help others overcome similar problems. “When it comes down to it, we’re just a couple of guys who love our kids and want to share the solution we’ve found with other people who need it,” Brian said. Brian keeps striving to make CoughDrop the best AAC app possible. Scot keeps working to help families learn that there is a way to help people without speech be heard. 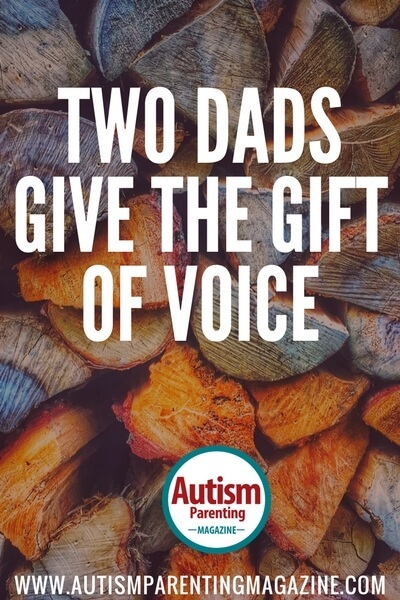 But deep down, they are really just two dads who want more than anything to give an incredible gift—the gift of voice–to the children they love best.